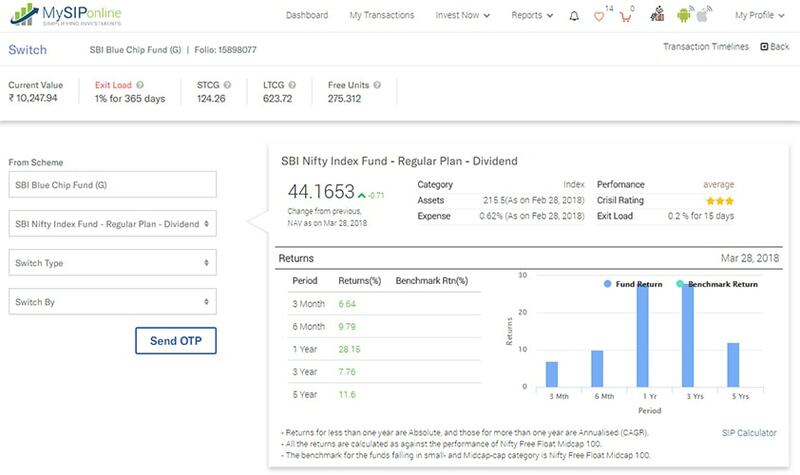 MySIPonline is the platform providing online solutions to make investments in the mutual fund programmes of the best-performing Asset Management Companies in India. Maintaining a stable position in the market with an efficient team of fund analysts and financial advisors available 24/7, the aim is to achieve the leading position in the wealth management services. Serving the investing needs of more than 10000 clients in a hassle-free manner since December 2015. Once you get registered, a welcome mail is sent on your registered mail ID providing details about your account. 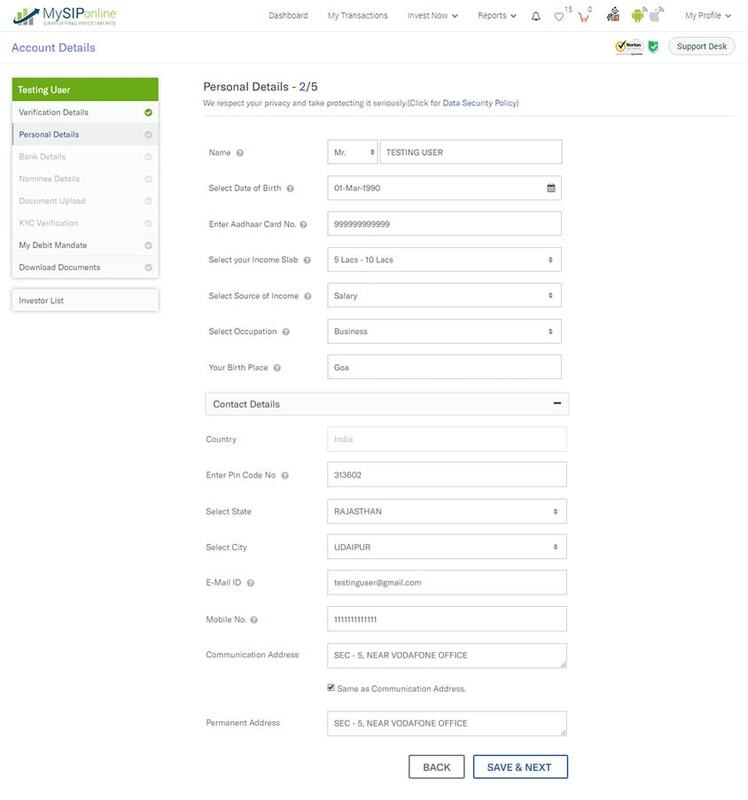 Password once created while registering can be changed or reset by clicking the forgot password option available. An OTP(One Time Password) is sent to your registered mobile number which can be used to set a new password. 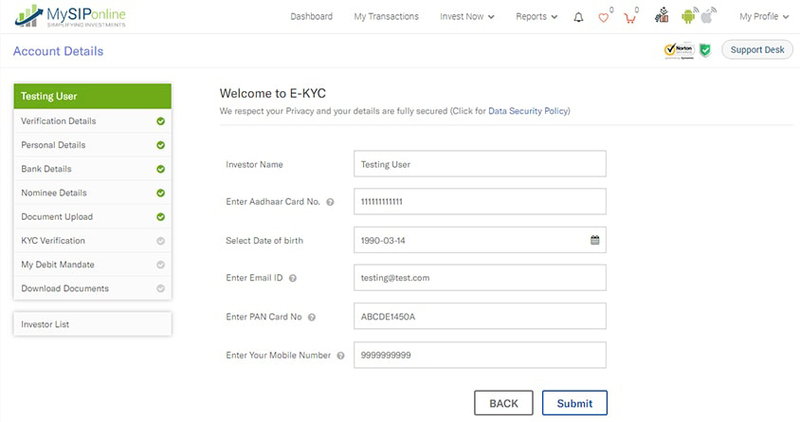 Once you login to your account, it is the time to verify your KYC compliance status. You are requested to be a KYC compliant to start your investments. 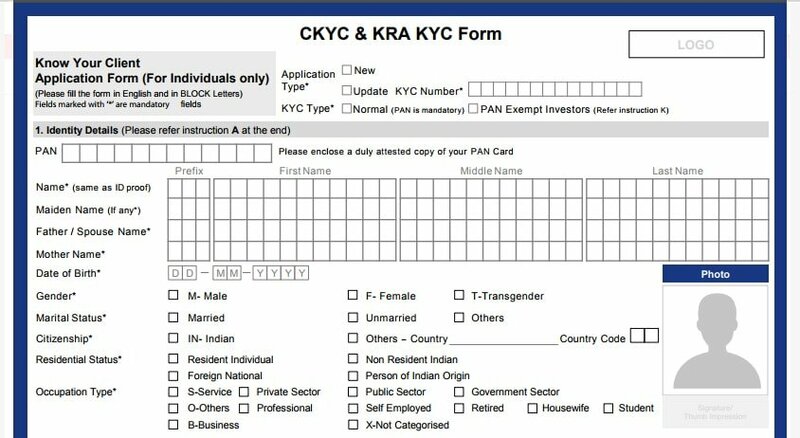 After completing the verification details and becoming a KYC compliant, you are further requested to complete profile by furnishing the personal details including name, Adhaar Card No., tax status, PAN details, contact information and other related particulars as mentioned therein. Further, you are required to furnish the details of the respective bank with which you are associating your mutual fund investment. A nominee has to be allotted who shall be having the legal rights to own the investments on behalf of the investor. There can be maximum two nominees and the proportionate allotment of the funds between them must be equal to 100 percent. Details of the allotted nominees are required to be presented. The last requirement for completing profile is the documents which are to be furnished. Upload the scanned documents of PAN Card, Specimen Signature, and a Cancelled Cheque/Bank Statement. KYC is an important ingredient for investment in mutual funds which can be done using any one of the two methods out of “E-KYC” and “Physical KYC”. To proceed for any one of the processes, click on the ‘Proceed’ button provided there under. The hassle-free online process to become a KYC compliant. You are requested to provide your Name and Adhaar Card No., for further processing of the KYC compliance. For physical KYC, our team would assist you in processing and for that you need to provide your identity and address proof at first which must be duly signed and required to be sent at the address provided there under. SIP- Whereby a small amount of money is to be invested at regular interval. Lumpsum- Where in the entire investment amount has to be submitted at once. The transaction of your investment is completed in a hassle-free manner passing the secure payment gateway. 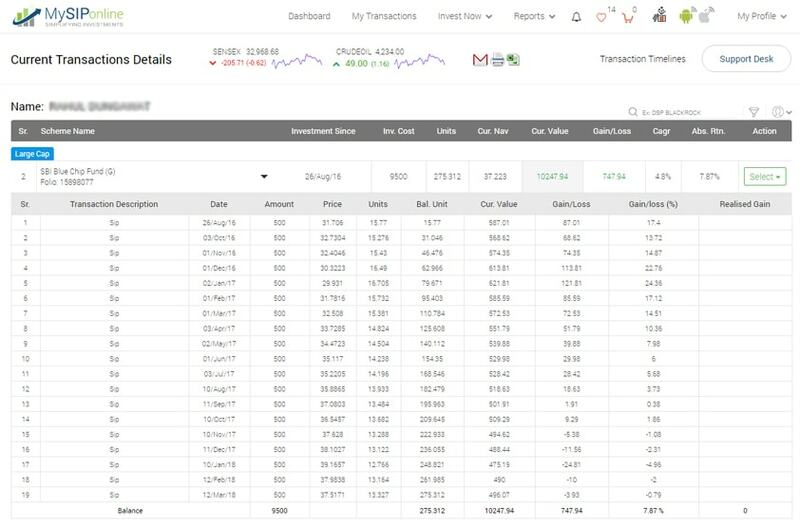 Summarised view of the account showing the current values of the invested capital with net profit or loss. 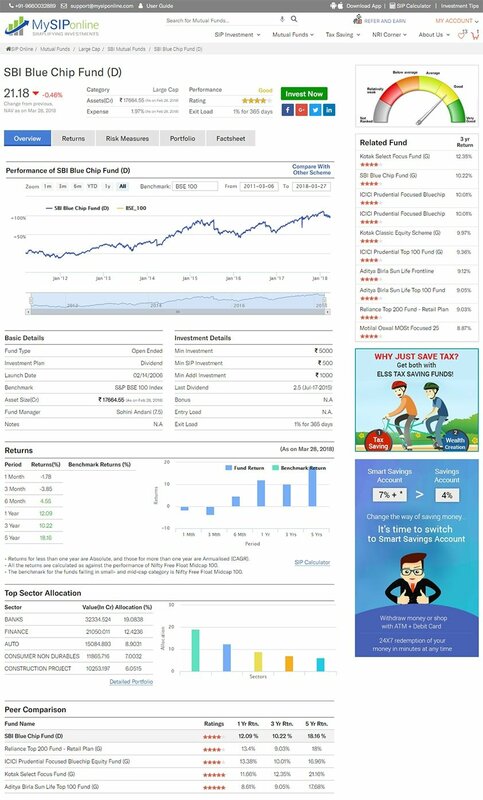 Review the market performance through NIFTY or SENSEX Index. 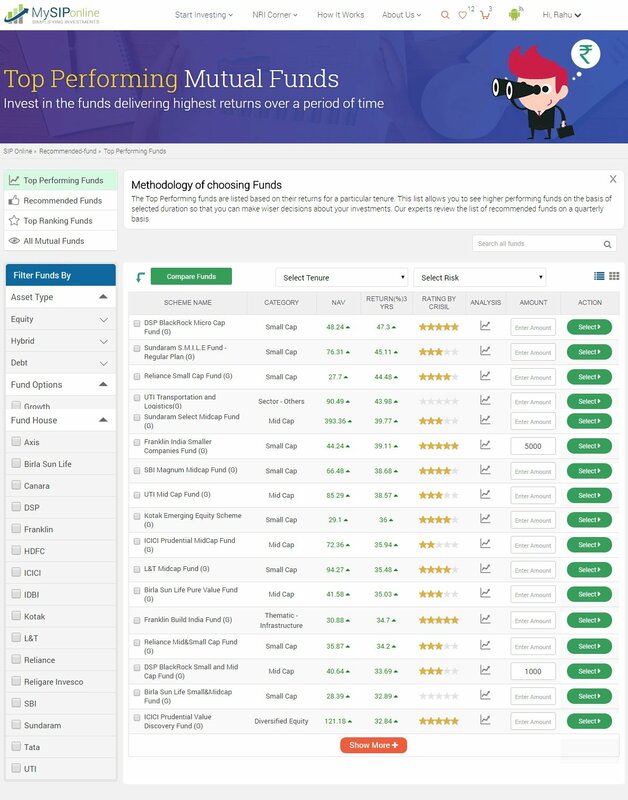 A smart search to find a preferable fund across the thousands of schemes of different fund houses. Select an asset type out of equity, debt or hybrid and to shortlist the schemes accordingly. The categorically search option makes finding schemes even more feasible. 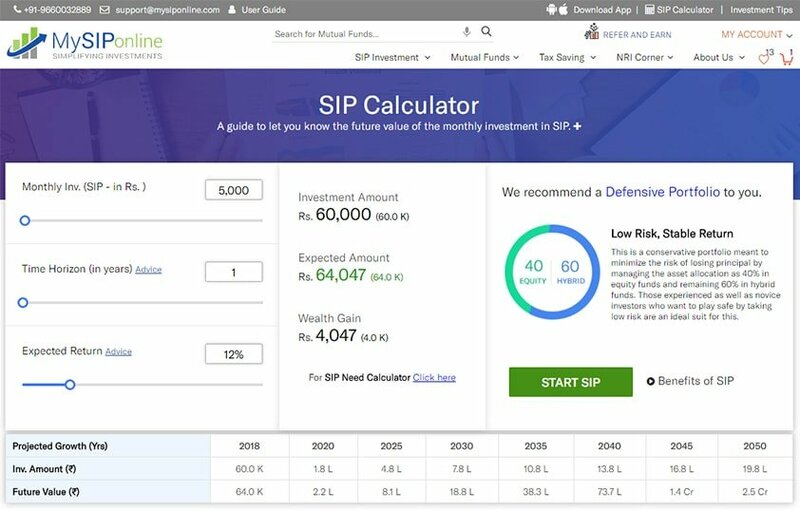 While searching, you get the option to either buy SIP or a Lump sum then and there, or add the scheme to the list by clicking the + icon. 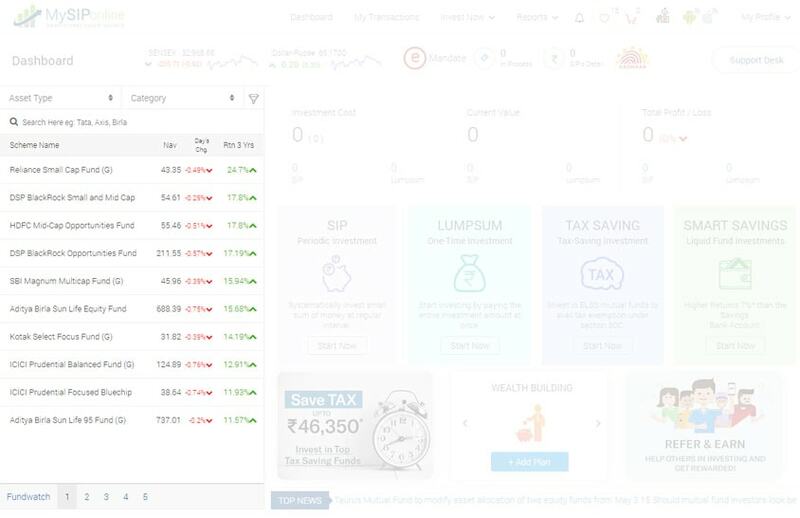 The schemes added to the list can be bought via SIP or Lumpsum, be added to the cart from there only, be analysed with the per day NAV and monthly or yearly returns performances. X denotes the option to remove the scheme from the list. Enhance savings and earn better returns to fulfil instant cash requirements by adding money to the liquid funds. 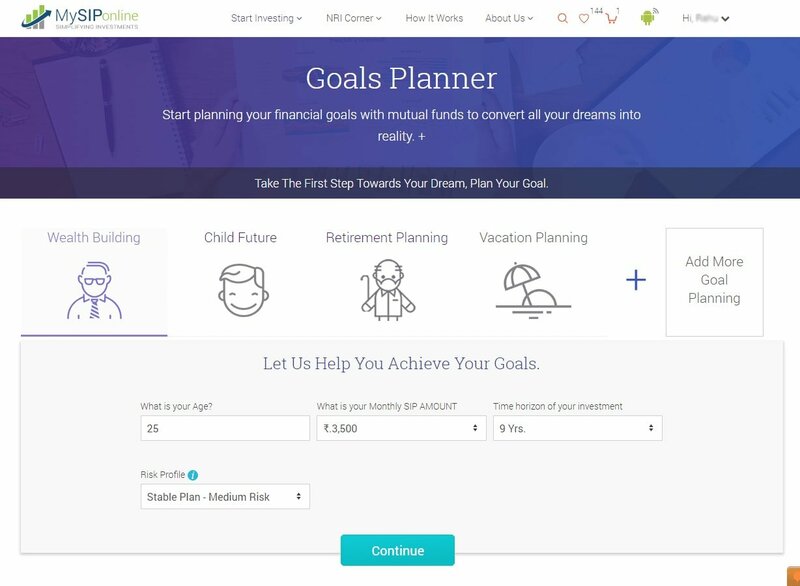 For the goal-based investment, enhance your investment portfolio by adding more goals to be accomplished by availing some of the recommendations. The transactions in process which have not been completed are visible here. Their pending status along with the reasons have been provided. Insight of the total transactions processed by the account holder with the specific details related to returns, profit or loss. 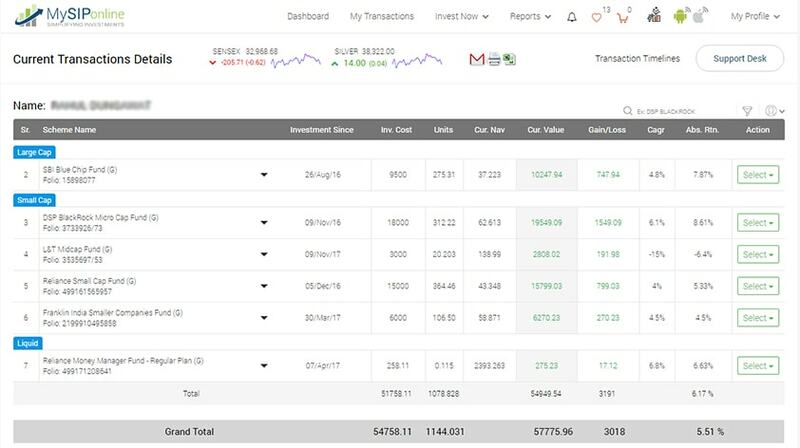 Evaluate every single investment by analysing the overall cost, number of units, current NAV, current investment value, CAGR, absolute returns, total profit or loss. 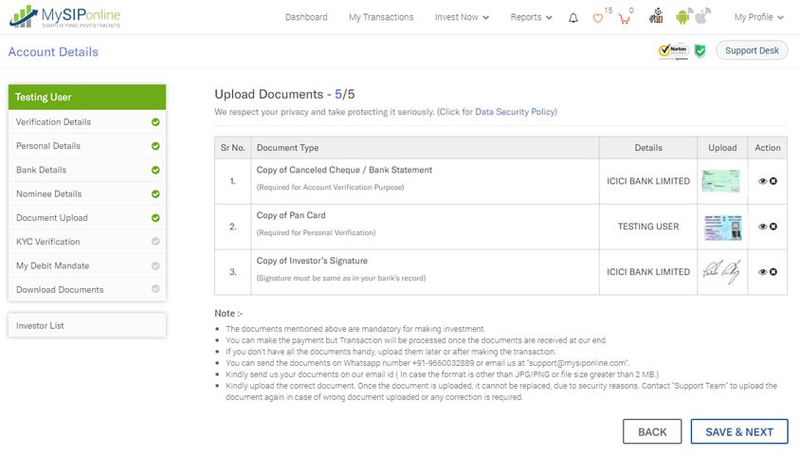 To keep a record of the transaction data, investors can mail the report to their respective mail IDs. 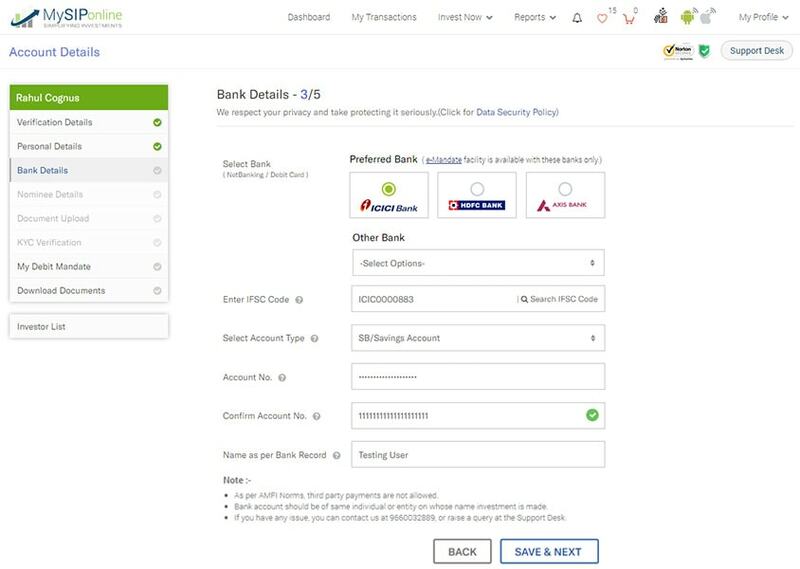 The transaction details of the family member can be analysed by opening their transaction details after selecting the name of the member from the drop-down menu present at the right-end corner. 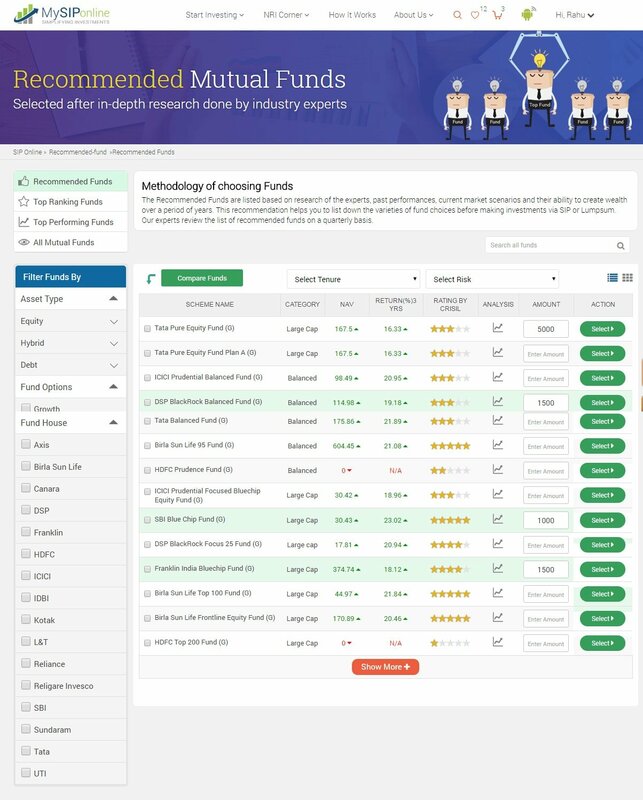 Take review of the past performance of all the mutual fund programmes you have invested in. Their monthly/yearly returns are mentioned therein. To perform specific action for making changes in the investments the 'Action' column is provided. You can select any one of the action out of the various to make the required changes. To enhance the earning one can make an additional lumpsum purchase in the current investment by adding a certain amount of money. Investors are given the option to increase their monthly SIP investments with a certain amount. 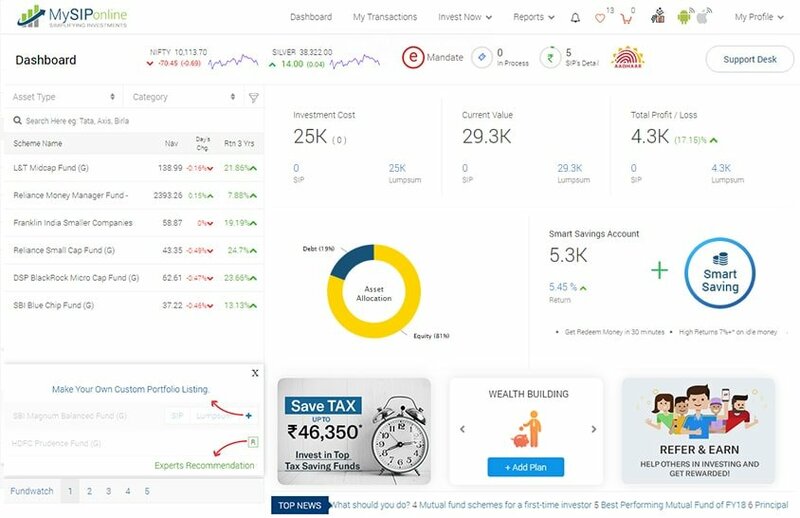 Finding the current investment non-performing, investors can switch to some other mutual fund programme with a single click. 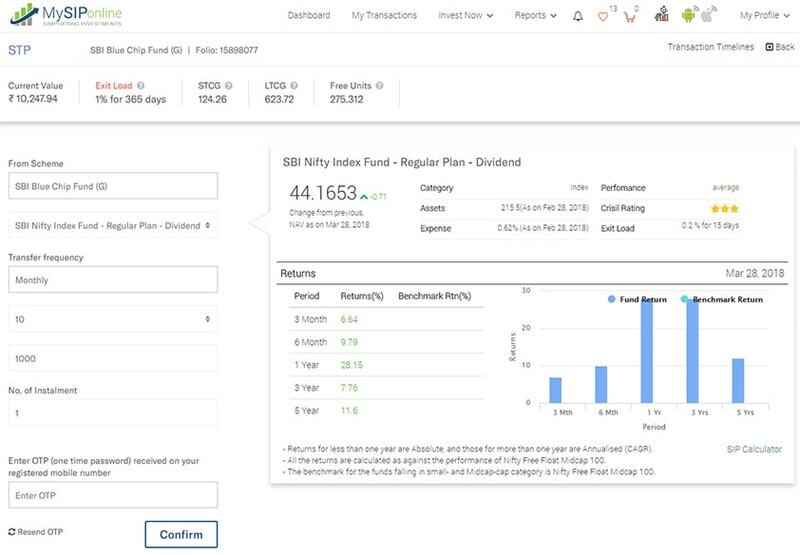 Investors are given the opportunity to invest a lumpsum amount in a scheme and regularly transfer a fixed or variable amount into another scheme, it is called Systematic Transfer Plan. To accomplish the specific financial goals, the goal-based investment schemes are formulated for the investors. 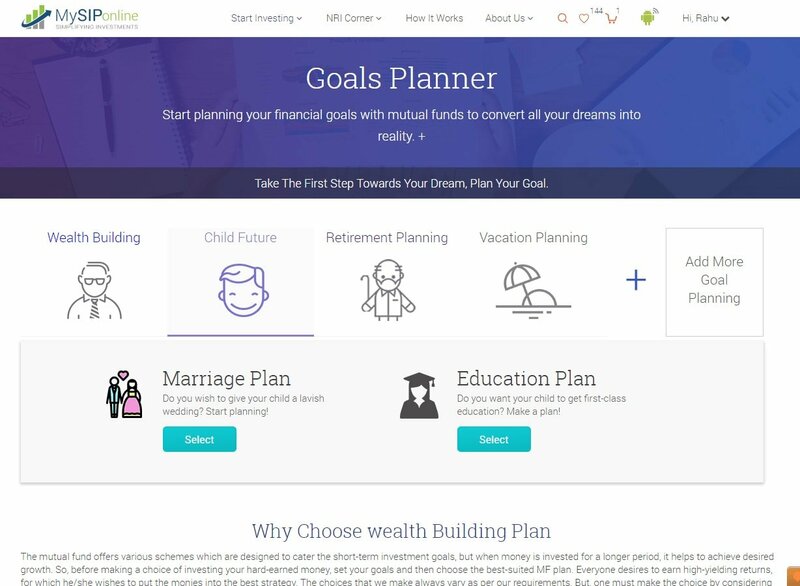 To enhance the worth of invested capital and create wealth for the future, the wealth building plan has been designed. One has the option to invest in the schemes providing wealth creation via SIP or lumpsum. To brighten the future of your children the education and marriage plans are designed. Investors can invest via SIP or by making the lumpsum payment to either plan their child’s better education or for a lavish wedding. 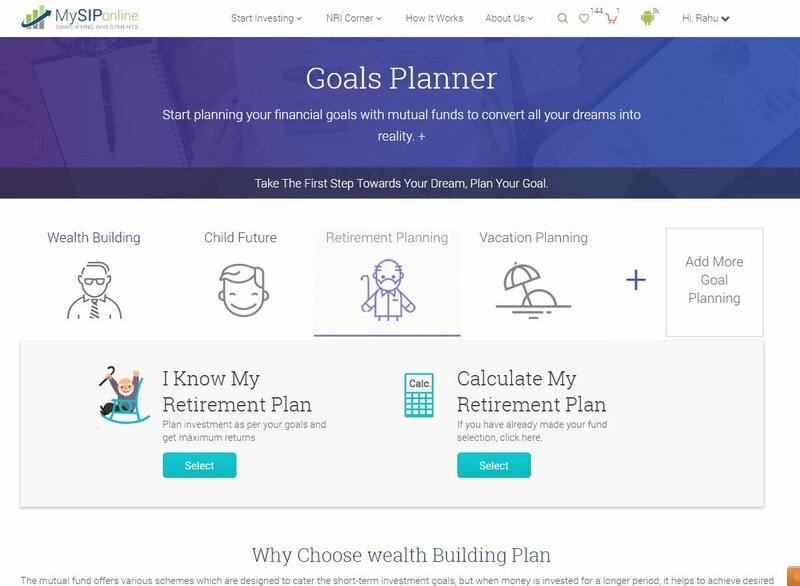 Planning retirement is made easy by providing a simplified process of selecting the best retirement investment plans. SIP or lumpsum investment alternatives are being provided to get started. 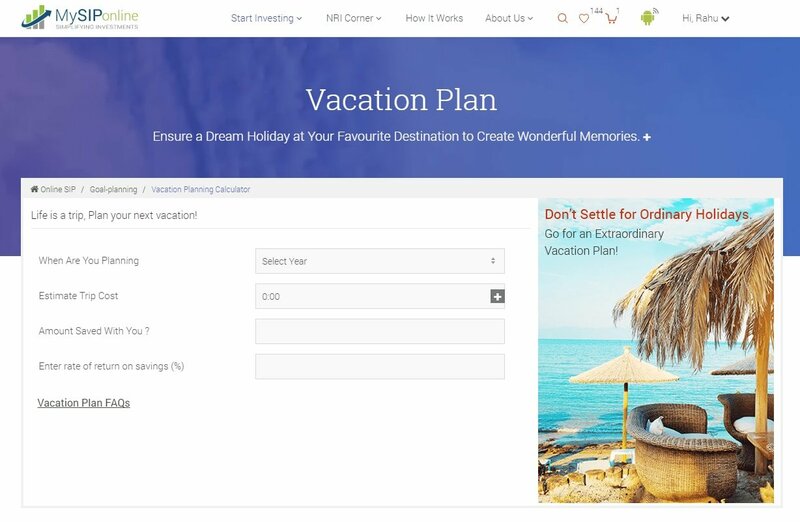 Invest the funds to go for a dream vacation by making an investment for a vacation plan. Invest via SIP or lumpsum as per the convenience. Tax management is no longer a difficult task. 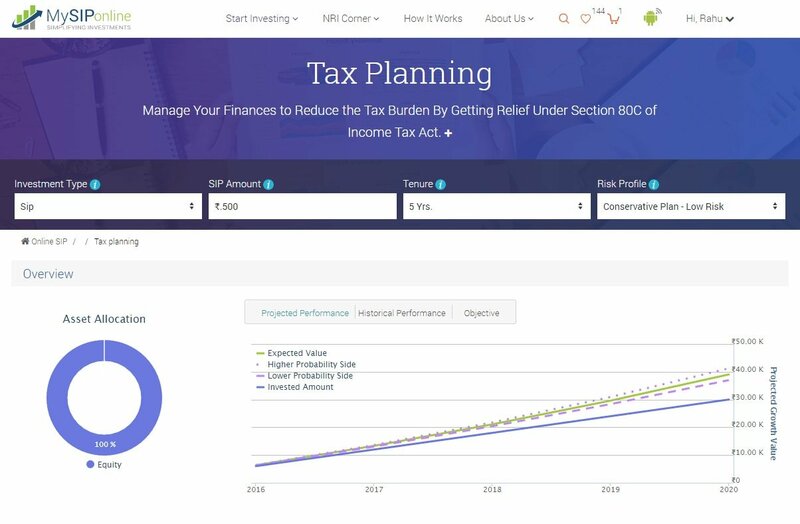 Make a plan providing tax savings along with capital appreciation. Investing can be done via SIP or lumpsum payment. 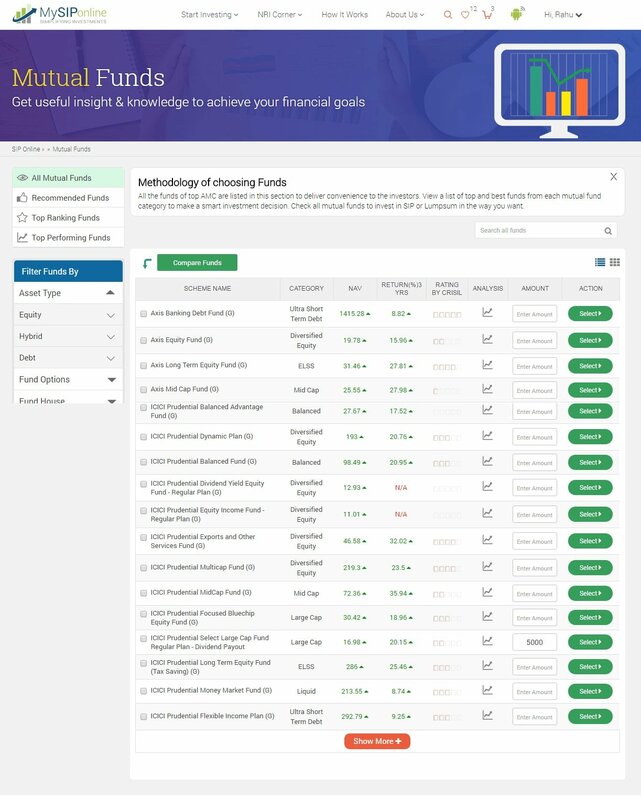 The investors are provided with the list of mutual fund programmes based on the past performance, current market scenario, and their ability to create wealth over time. The list includes scheme from various fund houses and assets and investors can invest in them either via SIP or Lumpsum. The funds are listed by our experts on the basis of the returns for a selected duration or a particular tenure. The list is modified on a quarterly basis. Investors can invest in the listed schemes either via SIP or by making a lumpsum payment. Funds are listed on the basis of CRISIL rating which is updated on a quarterly basis. Investors can buy an SIP or a lumpsum investment in the schemes so listed. 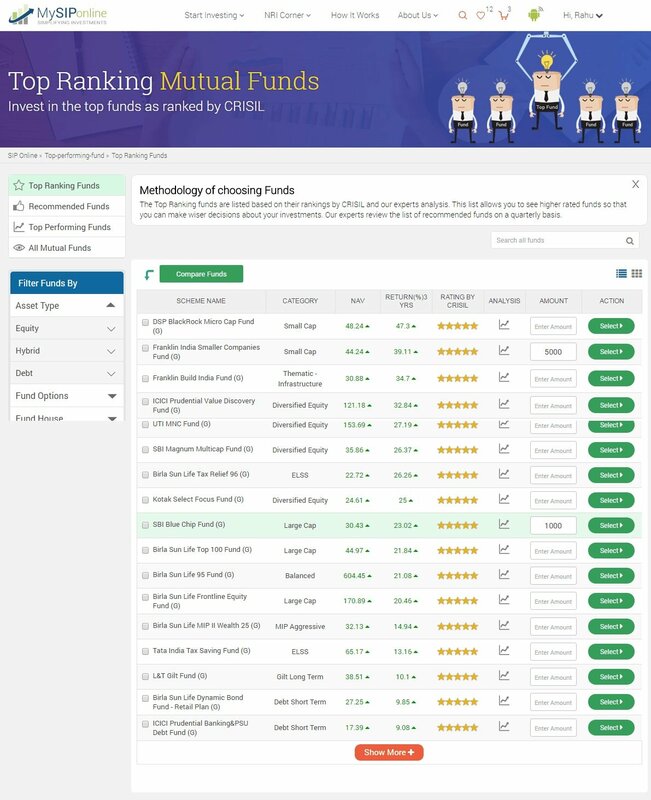 To deliver convenience to the investors in finding mutual fund schemes across several categories and fund houses, all mutual funds are listed at a single place. Investments can be made either via SIP or by lumpsum purchase. To get an insight of the performance, portfolio and other scheme-related detail, the page has been designed. The investors can fully analyse a particular plan from and take decision of investing in it via SIP or lumpsum. An online solution to compute the accurate value of the investment after a certain period.The graph depicts the growth of the invested amount in the specified investment horizon. The projected SIP returns for different period is presented in the table. 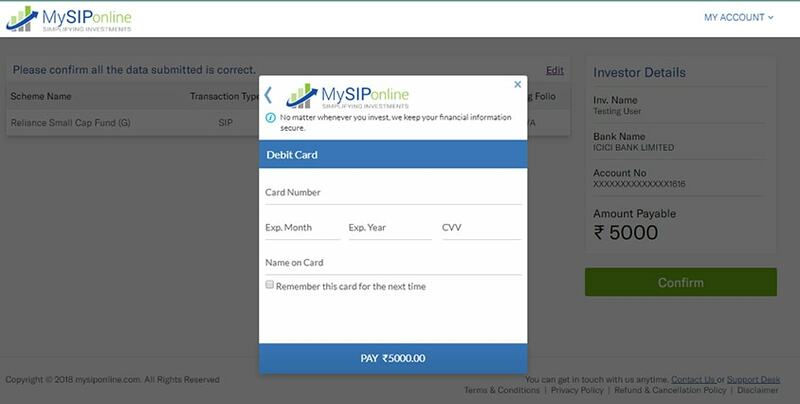 On being satisfied with the returns, Click “Start SIP” to initiate investing. Calculation of the total tax liability made easier with this online tool. 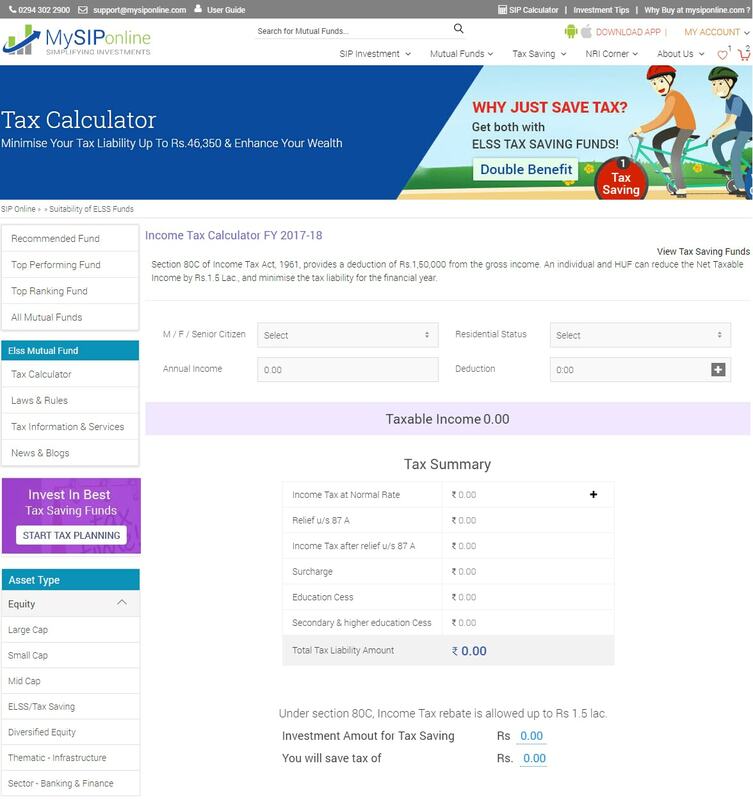 Open the calculator page the toolbar as shown below:One needs to specify the specification that include the residential status, assessment year, etc., and the net taxable amount to evaluate the Net Tax Payable along with the applicable cess and surcharge. 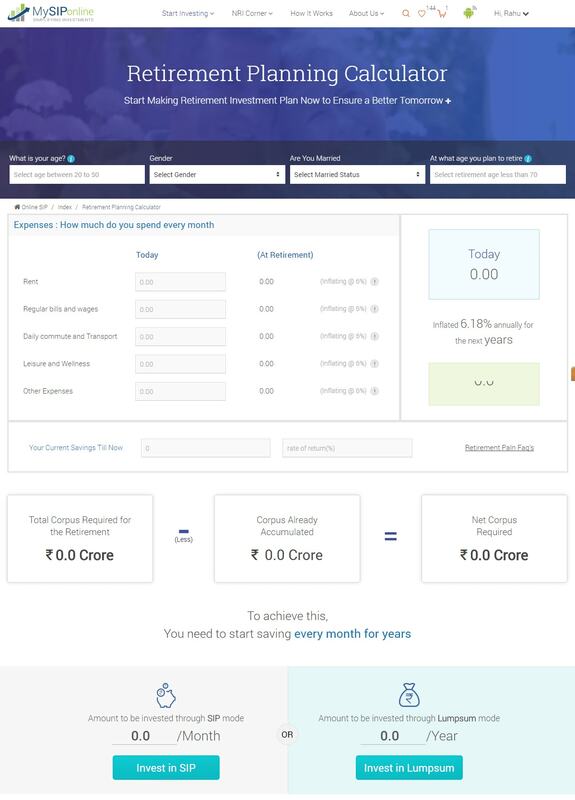 Compute the total expenses to be borne post retirement on the basis of the current expenditures.Once the accurate post retirement expenses are computed, evaluate the amount to be invested now to maintain the desired living standard. Any one out of SIP or Lumpsum can be opted to start planning for retirement. 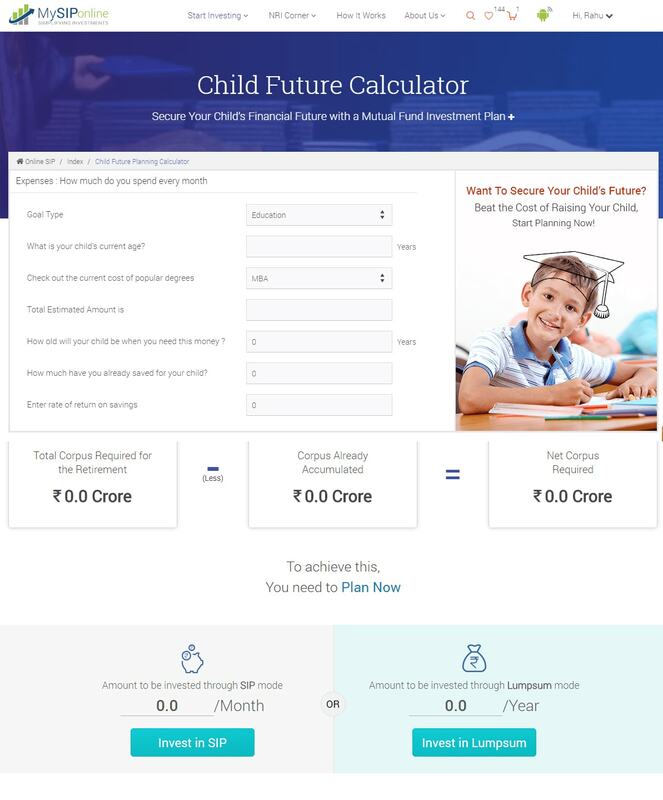 Calculate the amount you need to invest now for planning better education or a lavish wedding for your child. Calculating the amount t be invested for planning a dream vacation is no more a difficult task. Just fill in the specifications and you get an exact solution. 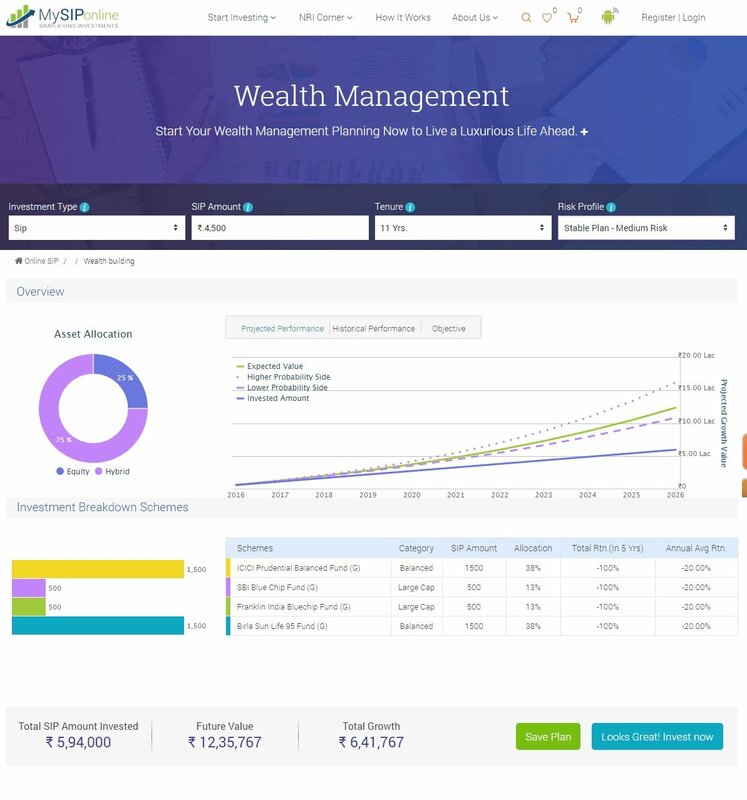 Calculate the accurate amount of investment to build a huge wealth. The graph depicts the growth of the invested capital. You get the recommendations for investing in the Investment Breakdown Schemes. 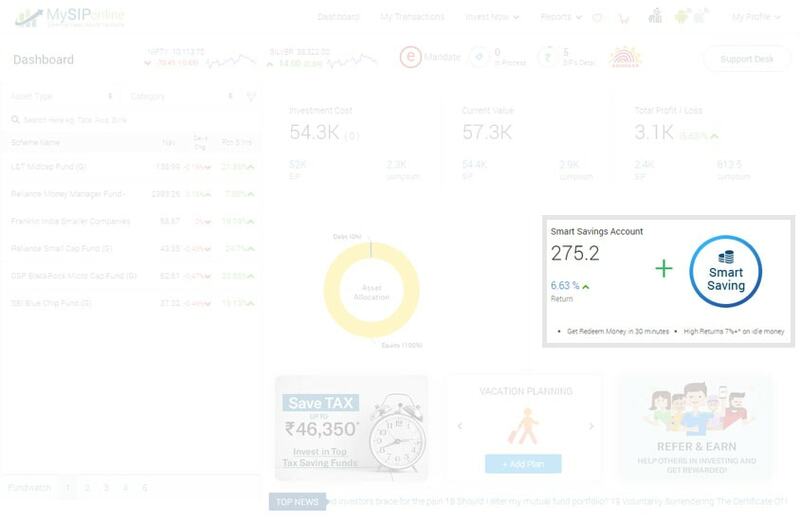 To raise a query an get instant solution you can easily avail our assistance by clicking the ‘Support’ option available on the right-top corner of the dashboard.One can choose any of the category regarding which the query has to be raised for getting better solution then and there. The password security is ensured with the 256-bit encryption and SSL(Secure Socket Layers) standards, and its generation and storage is done in encrypted form. 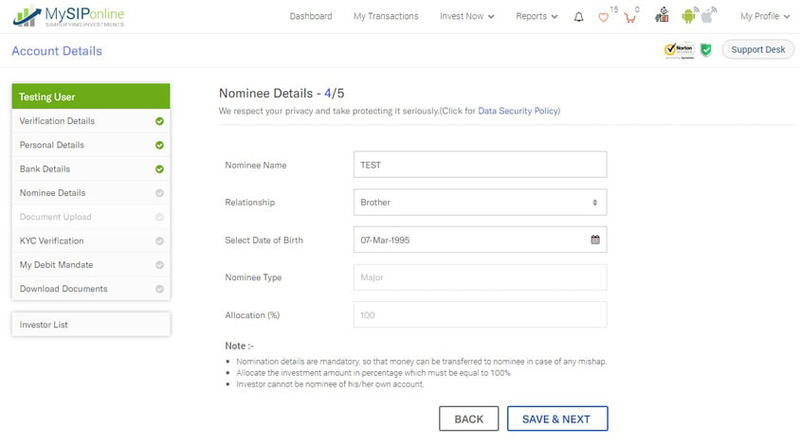 Client’s personal details and data cannot be retrieved by any third party. The financial data is secure and it is assured that clients’ money is never transferred without their consent. The safety of the financial data is same as provided by your banks. Being a registered entity under AMFI and approved by SEBI, we follow their regulations to safeguard the interest of investors. The grievances of our clients is handled by our “Compliance Officer Mr Alok Verma ” at +91-9660032889.